This week on The Graduates, we speak with Dr. Natalia Villavicencio, recent graduate from the Department of Integrative Biology at UC Berkeley. Natalia's research focuses on the roles that humans and climate change play in driving animals to extinction, in the past and in the present. In the interview, Natalia talks about paleoclimate, understanding past ecosystems, and her work in the Atacama Desert of Chile. 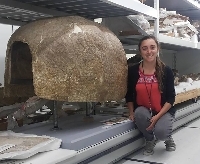 Natalia also discusses the extinction of large mammals in South America and describes some of her experiences as an international student here at Berkeley.